ThePixel | Is Cheap Website Hosting Killing Your Online SEO? Is Cheap Website Hosting Killing Your Online SEO? Home > Blog > Hosting > Is Cheap Website Hosting Killing Your Online SEO? Did you just go with the least expensive option when you shopped around for a web host? It’s a mistake that many small businesses make because few realize just how harmful cheap web hosting can be to search engine performance. Because SEO and web hosting are closely linked in two key ways, choosing a cut rate provider is likely to cost you much more than you expected. Let’s review a couple potential problems that we see again and again from small businesses dealing with bad hosting. Google has been extremely secretive about many of the factors included in their search engine ranking algorithm. They haven’t been so tight lipped about page loading speed. Many times in the past they have explicitly stated that the amount of time it takes to load a page is factored into that page’s rankings. It may not play a huge role, but it’s definitely one of the things Google and other search engines are looking at to determine the quality of your site. If your pages are loading slowly and site development or coding aren’t the culprits, the problem could easily be that your host has placed you on the same server as thousands of other sites. Naturally, the more sites that occupy the same server, the slower they all will load. Cut rate hosts often overload servers in order to minimize the amount of resources they need to manage. Learn more about how Site Speed – A Critical Factor Some Businesses Overlook. Test your page load speed here to find out if you have a problem that needs to be addressed. I don’t need to tell you it’s bad for your site to be down. Every minute that your pages are inaccessible raises the potential of losing customers to the competition. However, the overall impact might actually be worse than you realize because downtime also can hurt your search engine performance. That means a cut rate provider’s routinely downed servers could be hurting you even when you’re up and running smoothly. Google doesn’t want to feature unreliable sites in their search results. If their spiders are checking your pages and finding them inaccessible on anything close to a regular basis, that will be a strong reason for them to flag you as unreliable. Downgraded rankings are likely to follow. Sometimes with a cheap provider, downtime frequency isn’t bad but the response time is so slow that the down hours add up to a significant problem for a business website. Our popular website hosting packages are perfect for B2B or B2C websites. We can create a custom website hosting package for your business, contact us today & get started! Web hosts that offer free or extremely cheap plans rarely provide backups. If something goes wrong with your site and you need to undo changes or revert to an earlier version, you’ll be in trouble. They expect you to take responsibility for saving a backup of your site. If you don’t have one, even relatively minor fixes could result in lots of downtime. Location of IP address has proven to affect search engine performance. This is relevant to businesses with cheap hosting because some cut rate providers are based outside the US and may assign IP addresses associated with foreign countries. That foreign IP could harm your site’s relevancy in the eyes of Google. Many web experts equate choosing a bad hosting provider with choosing to build your business in a bad neighborhood. If you’re sharing an IP address with spammy — perhaps even criminal — websites, then you risk getting shut down when one of the bad actors in your neighborhood incurs a penalty. Customer support is often found lacking in low cost providers. As mentioned earlier, poor customer service could translate to slow response times during server outages. Not being able to get someone on the phone when something goes wrong is bound to prolong any problem you’re having with your hosting. Speak to ThePixel & Get Started Today! Having a good host won’t guarantee you top rankings, but a bad host definitely can prevent you from maximizing your search engine visibility. 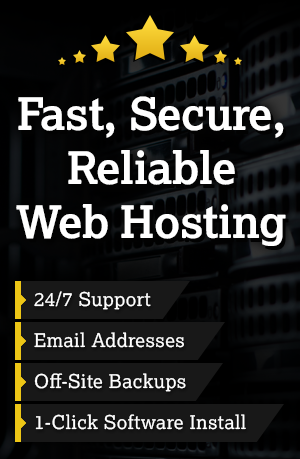 Please contact us or call (563) 543-6433, and we’ll work with you to build a successful website hosting solution. If you’re struggling with bad rankings, slow load times, too much downtime, or any other hosting-related issues that could be harming your performance on search engines, ThePixel will help you find a solution.